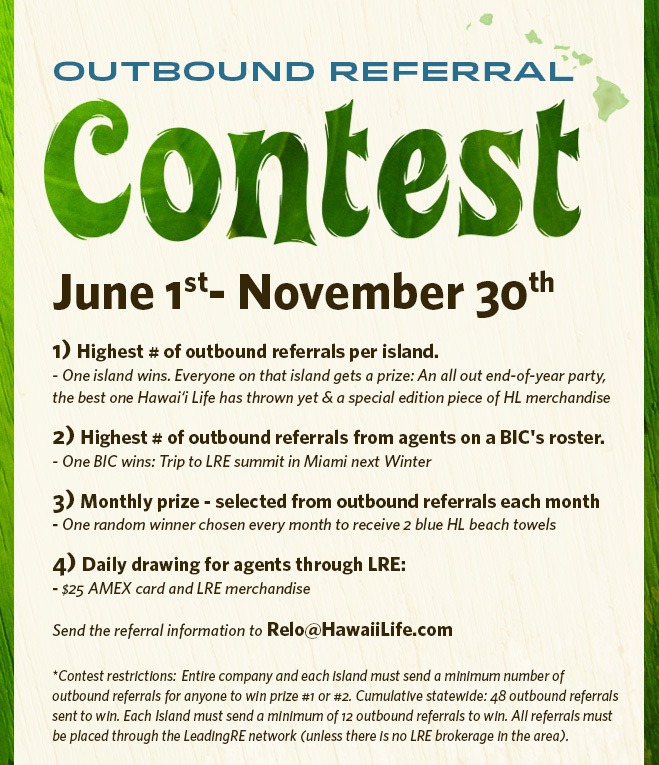 Outbound Referral Contest Monthly Winners! There are two months left in the referral contest, so you have two more chances to win! You can join Monica Schaefer (June), Alison Wisnom (July and August) and David Richardson (September) as one of the random monthly winners, drawn from the pool of agents who submitted outbound referrals each month. We appreciate your referrals, and as part of the contest you can win 2 Hawaii Life towels, in addition to the fee you earn when the referral closes! Send your client information to Relo@HawaiiLife.com and we'll take care of the rest. Keep up the great work Monica, Alison and David!